In a previous post we covered what the best way was to include jQuery in WordPress. In this post, I’m going to talk a little more about the best ways to include Javascipt files. I’m going to discuss my approach and why I think it’s best. It’s important in this scenario that you list the dependant scripts as dependencies, rather then just list them in order. This is to make sure that they are loaded prior to the one who needs it. For the handles, the custom script should have a prefix; like ‘themename-custom’ or ‘themename-child-custom’ to avoid accidently ending up with the same handle as something else. For example; if two plugins loaded ‘main’ or ‘custom’ you’ll have a problem. It’s considered best practice that third party scripts use their name as their handle, i.e.’select2′. This is so that if something else is already loading select2, it would not bother loading it twice. Also, loading them twice could course a problem. By not including the third party scripts in your custom script, it makes that custom script much easier to override. By sharing scripts you potentally reduce bloat, if several items on the site are using select2 why increase network calls and download sizes by including them again? That all sounds great right? Yes,v but there is a problem; WordPress’s dependency handling is not that great and the main problem we have is with versions. Take this scenario. You enclude select2 in your theme. A user installs a plugin that also includes select2. But, they depend on a different version of select2. Dependant on load piorities, the theme or plugin could break. If they use a different handle you could end up loading it twice. Its likely now you’ll create a ‘already defined’ error unless the script has checked for this. If it has then you’re back to the other problem; only one version will load and it may not be the right one. By enquing our third party scripts, we have introduced a potential point of failure. The dependacy option in the enqueue call is only really used for loading the scripts in the correct order. Also, the version number supplied only really helps you to programmically to check the version number of a script, something you can do in your own code to check a loaded script’s version number, but you can’t make a third party plugin do that too. When you combine the third party scripts yourself, you control the process and you can be sure that the scripts have been combined in the correct order and that nothing breaks. You’ve tested that the combined file is working before it gets released. With the magic combine scripts button, you don’t really know what’s going to happen. When combining your scripts, you can isolute them so their functions are only available to your project and are not in the global namespace. This completely removes any fear of conflicts. Sure, it means you can end up with the same select2 script being loaded in multiple projects accross your site and we all know that you should be DRY. But I think the potental conflict issues are more of a problem. You should however, always, unless for good reason use the core’s supplied versions of scripts. Like with jQuery, you shouldn’t be suppling your own. You should be looking to make your script compatible with the cores version. The sharing situation there is different, because all plugins and themes that are keeping maintained will be keeping them selves up to date with the version of jQuery suppplied by core. for people to override a enqueued file then one bundled up. But if you package your project correctly and provide the build script to your end users, then a developer will still be able to modify the project and just rebuild it after. They would be able to unqueue the main project file, build there own from the build script you’ve provided then reload it in their extension plugin or child theme. The build script being the webpack file, gulp file, package.json etc or whatever you used. If you purely just combined files, then even just the unminified version will allow them to modify it. There is, of course the matter of whether you want your users/clients to be able to override things… That is a different discussion. We’ve talked mostly about third part scripts thus far; what about your own custom modules that wont be shared by other projects, other then potential extentions? Well the main benefit to listing them seperatly is for any extentions, whether your own or others, the same as with third party scripts. I often find that when I try to reuse code accross projects, it doesn’t really work out that well. It introduces complexity in the form of compatibility – so I’m not really a fan. When combining and isolating those modules from the glocal namespace, you don’t have to worry about comflicts in the same way as with third party ones. I think that there is much less reason to not combine than there is with common third party ones. Those doing exentions can build the project as discussed previously. I always build custom modules into one script and very rarely will I enqueue them seperately. I feel that it’s not a cut and dry issue, so that’s my take on it. I’m interested to hear others thoughts on it. When I wanted to sell my themes on my own site, I started out with Easy Digital Downloads combined with various EDD extensions. As time went on, I got more interested in creating maintainable websites. Building websites with a group of plugins is a great way of bootstrapping a website quickly. Which is good for testing out an idea and getting a product to market quickly, but does create a site that requires a lot more time. I wanted to create a website that was easy to maintain, that once built, I could almost forget about and concentrate on other projects or marketing and spend less time on maintenance. I considered just writing custom code instead. That way I could write code that required less maintenance. But that’s a big investment in something that doesn’t make me a lot of money and probably never will. Most theme authors will tell you that most sales come from 3rd party platforms – not via their own site. So I hardly wanted to now invest a lot of time. When you are running a WordPress website and you want to sell something, your mind naturally goes to WooCommerce or Easy Digital Downloads. But there are other options. I started to investigate third-party platforms. I tried a few and opted for Gumroad. Why would I do that if I have to pay a percentage per sale? I did some reading and found that some people actually saw an increase in sales after switching to Gumroad after selling on their own site. A lot of people know Gumroad, have already purchased from there and if they haven’t then a quick google can tell them that it’s safe. I think that sales did increase after I switched. By removing all those plugins associated with running a store, it reduces the maintenance required and thus saves me time. That time costs money because it’s time that could have been used elsewhere. It took me a lot more time to setup and skin EDD then it did putting my products on Gumroad. It also allows you to get selling quickly to test out a product, before investing in the website. Good plugins cost so create an upfront cost. Set up also takes time as and time is money. So although I pay a commission, I only pay that for any sales I make. So if I don’t sell anything, I don’t pay anything. By keeping my website as just a blog, it means a faster website. Whatever I use to run my site, it can be served statically. By keeping the blog and E-commerce separate, I can be flexible with the blog. I can change themes without worrying about breaking something. I can also switch out WordPress and play with something else for fun. I’m currently using Jekyll, in the future I may go back to WordPress or even try something else. I’m a free agent. Often WordPress is used to bootstrap a website quickly to save time. I’d argue that often there are quicker ways to bootstrap websites. That won’t apply to every situation. But it’s worth thinking about whether you really need to have complex functionality on your site or whether a 3rd party site could provide the functionality you need, at least in the beginning. Some have very active traffic sources and don’t use a website. Say you’re a YouTuber or very active on social media. It’s not something that most of us want to bother about. The EU Tax law is something that’s quite laborious for a smaller company to deal with. I have seen many simply remove their own products so they don’t have to deal with in order to focus on their less legally burdened services. But with third parties like Gumroad, you don’t have to deal with EU Tax. In case you didn’t know, anyone selling to an EU citizen has to worry about it, your not except if you aren’t an EU citizen. I’m not saying that there is never a time to use WordPress solutions, of cause there is. But I think that often alternatives are overlooked when they could make a lot of sense. Because friends and family know I work with WordPress and know that I’ve worked with lot’s of WooCommerce stores, they can be surprised when I tell them not to open one right now and even more surprised when I tell them that I am not selling via WordPress. When they are just getting their feet wet in the E-Commerce world, when they are still defining their market and their product, learning how to run a WordPress store just isn’t the right focus for them. Down the line, when their site grows and they find that the percentage they are paying out to another service far outstrips the cost of running the store themselves, or when they find that there is something custom they want to do that they can’t do via that service. That’s the time to revisit the idea of running their own store. I have been selling with Gumroad now for quite some time and the maintenance my site has needed has been zero. I have no plugins to update. The only attention I pay my site is for content changes. My favourite way to run MySQL on mac is via Homebrew. It’s quick to get the latest stable version and it’s easy to run it. It also means that the commands are generic and not dependant on what version of the Mac OS you’re using. Something I really like about developing with other languages / frameworks is that many of them have servers built in. This is very convenient, so it was frustrating not having this with WordPress. Over the years I have run WordPress in many different ways, MAMP, MAMP Pro, LAMP, XAMPP, Flywheel, Vagrant, Docker etc. But all methods I’ve used have had issues where I have had to spend a lot of times troubleshooting it. The built in servers that Ruby, Jekyll etc have make local dev simple and quick. You can get on with the actual coding and not focus to much on the server stuff. But PHP does have a inbuilt PHP server, since 5.4.0, it just doesn’t get mentioned very much. It’s actually a great way of running a local install of WordPress when you don’t need bells and whistles, when all you need is a basic WordPress install. All you need is PHP installed and a MySQL server running, which I won’t cover in this tutorial, since it’s is platform specific. So from here on, I’m going to assume from here that you have them installed. Google it and come back when your setup. To check what you already have installed, type or paste the following into the terminal. Here is my personal cheatsheet for installing PHP and MySQL on Linux. To start, CD into your WordPress folder. This can be anywhere, you don’t have to stick to a specific folder as with other methods. I find this makes keeping my files in order a little easier. All you need is a folder with WordPress in it. You need to be at the root of your WordPress install, ie, where “wp-content” is. 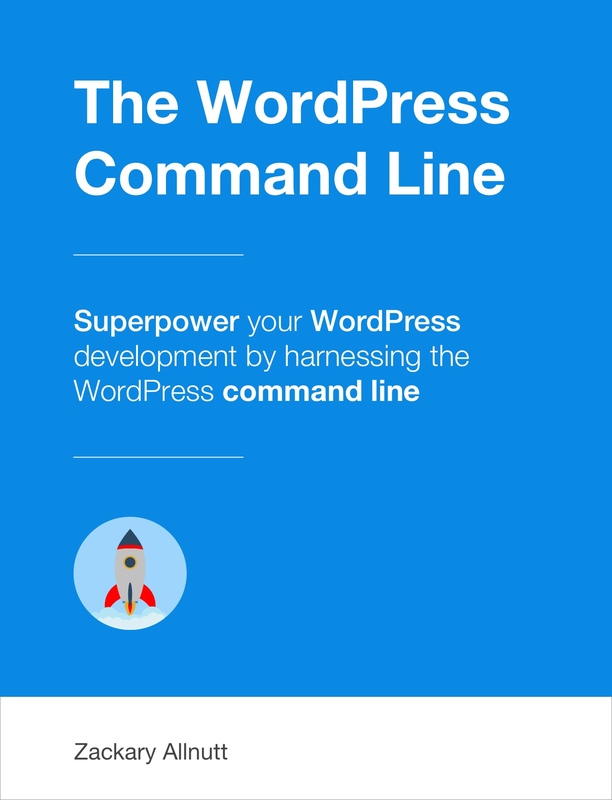 If you are starting from scratch, you can use this command to download WordPress, unzip it and cd into it. I have a “Dev” folder containing my projects. I’ll have a project folder that contains all relevant files for the project and I’ll have a WordPress folder that will contain my WordPress install for that project. You’ll need to provide your MySQL password. If you don’t know it, see this tutorial that covers setting and recovering your password. Whilst in the WordPress folder you can type or paste to start your php server. Now you can go to http://localhost:8000 to see your WordPress site and to run through the setup. When it comes to the database info, you use the same user name and password you used for setting up. Note: I don’t recommend using you root user and pass for a live site, only a local site not accessible to the public. You can change the port number to something else if you run more then one at the same time or that port is in use. You can also use port 80 which would mean that you don’t have to type the port for the URL but for me on Linux, that had to be done with sudo. Which is fine but messes up permissions, somewhat negating the simplicity of this method. To stop any running process, you can just close the terminal window ( or tab ) or press CTRL+C. WP CLI provides a wrapper for this and has lot’s of commands that aids setup and install. See our tutorial on that. Hosting, Why we recommend a manage VPS server. WordPress Child Theme. Why you need it.